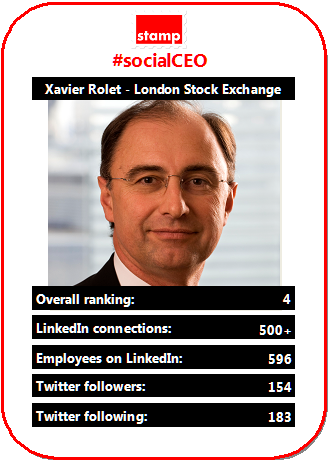 Continuing our countdown of the top ten #socialCEOs (based our October 2013 report data) and at number 4 the head of the London Stock Exchange group, Xavier Rolet. Xavier is one of the very few FTSE100 Chief Executives who is active on LinkedIn, and has a balanced, active Twitter presence (by balanced, we mean with a reasonable number of people being followed, indicating something of a two-way use of the service). There’s no “I’m a baby boomer, I don’t do that” complaint from Mr Rolet (he was born in 1959), although in October he’s never tweeted (and by time of writing he’d only just made his first contribution on the micro-blogging site). The LSE are also active at a corporate level on both Twitter and LinkedIn.